74k Capt. Everett Hartwell Steinmetz was the commanding officer of the U-3008 from 00.08.1945. Photo courtesy of the Crevalle (SS-291) thanks to John "Bud" Cunnally via Bill Gonyo. 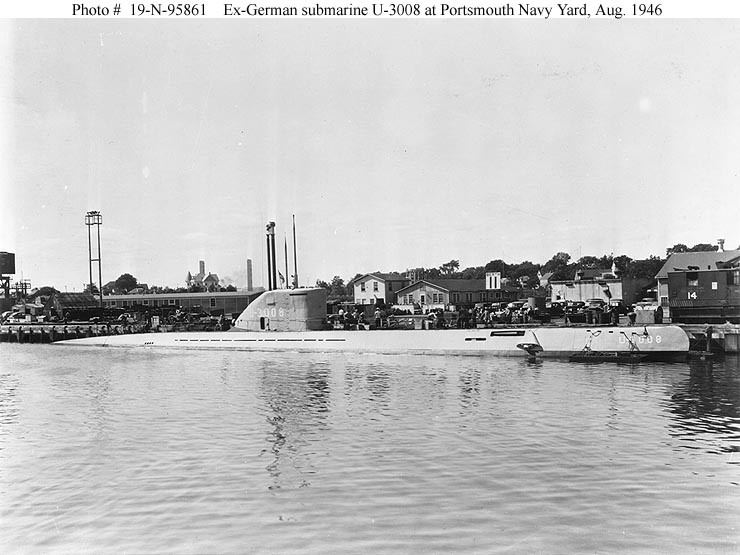 1.06k U-boats at New London: U-2513, U-3008 & possibly U-505, circa 1945. Photo i.d. courtesy of John Hart, Ric Hedman, Gudmundur Helgason, John Hummel & Robert Morqan. 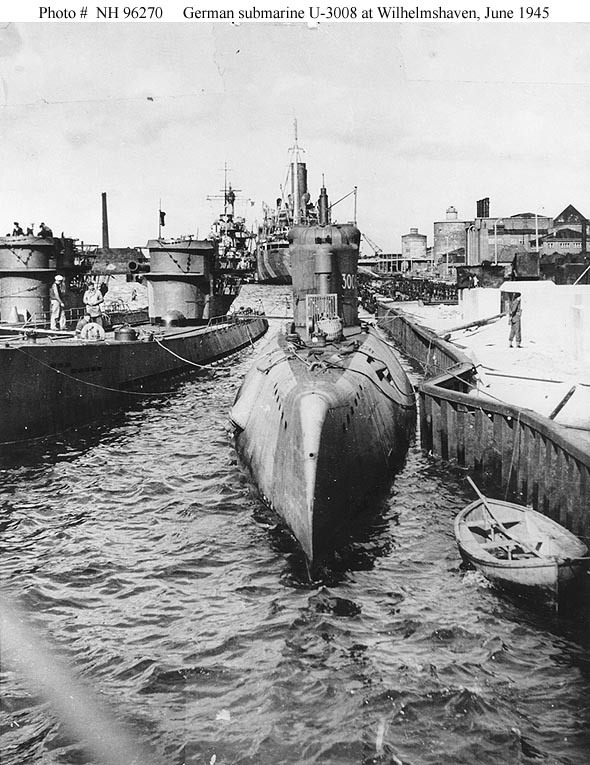 125k German Type XXI submarine, U-3008 at Wilhelmshaven, Germany, between 2 and 21 June 1945. 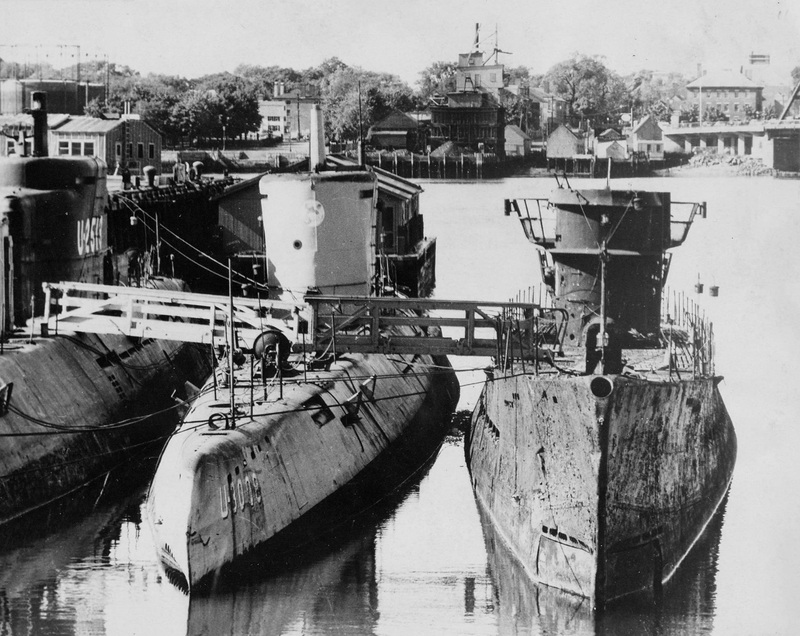 The two Type IX submarines with her are U-806) (far left) and U-155. The light cruiser Nurnberg is in the far left center. Copied from "Naval Technical Mission in Europe Technical Report Number 403-45: The Influence of High Submerged Speed on German Submarine Hulls". Official USN photo # NH 96270, from the collections of the Naval Historical Center. 162k Early in 1946, Argonaut (SS-475) was assigned to the Atlantic Fleet and was based at Panama. While en route to Panama, Argonaut collided with Honolulu (CL-48) off the eastern coast between New York and Philadelphia during a heavy fog. Both ships sustained minor damage and Argonaut continued on to Panama. She is pictured here with civilians on board inspecting her damage while she is docked next to the captured German U-boat U-3008. Based on the retracted (into the hull) bow planes and the low profile, twin gun mount in the sail, the boat could only be a German Type XXI. 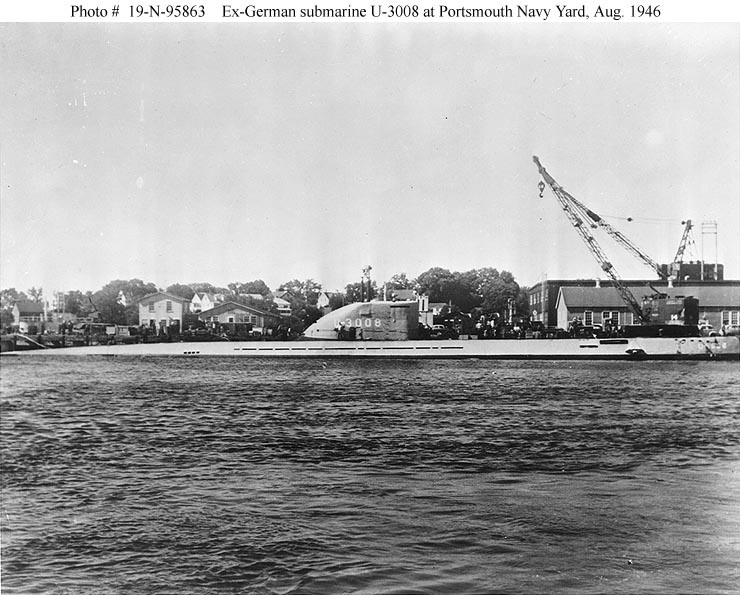 According to DANFS, the former German U-3008, an American War Prize, was at the Portsmouth Naval Shipyard, Kittery, Maine, from the Fall of 1945 until August, 1946. Since the date on the photo is January 12, 1946, this would place the former German vessel at the right place, at the right time. Text courtesy of DANFS. Text i.d. courtesy of Bill Fessenden. USN photo # 45-46, courtesy of Scott Koen & ussnewyork.com. 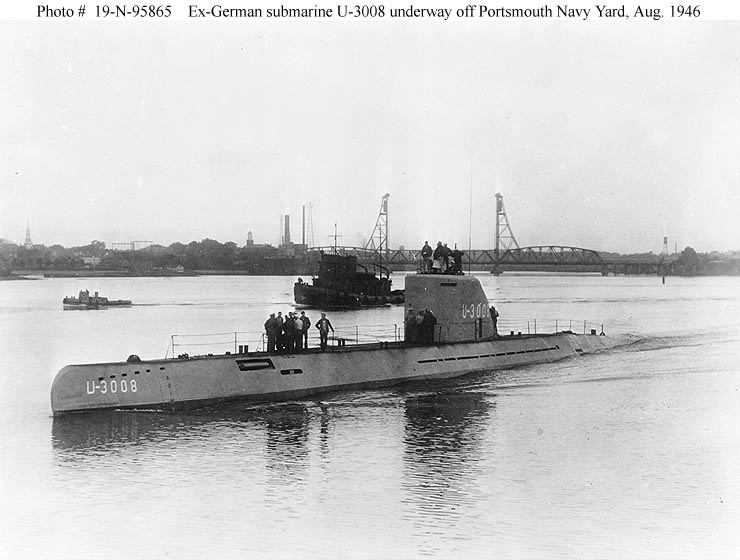 65k U-3008 underway off the Portsmouth Naval Shipyard, Kittery, Maine, 30 August 1946. 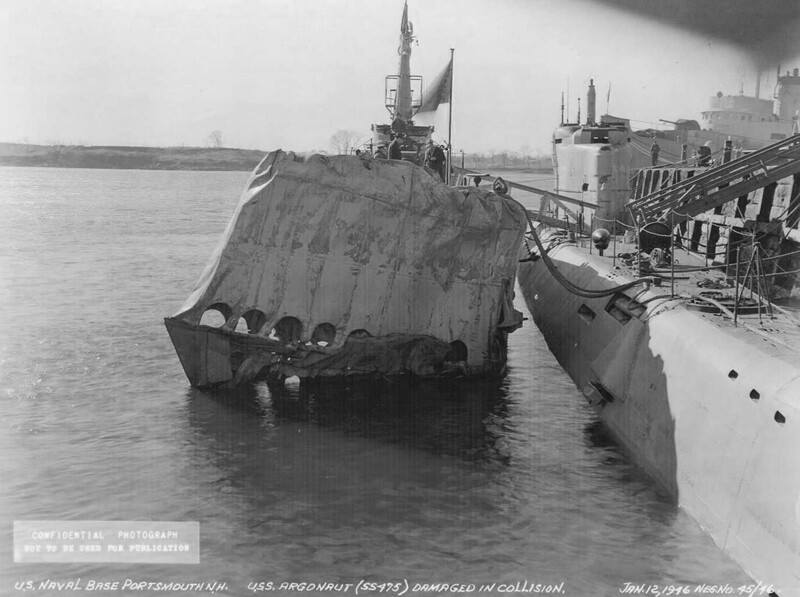 Photograph from the Bureau of Ships Collection in the U.S. National Archives. Official USN photo # 19-N-95865, from the collections of the Naval Historical Center. 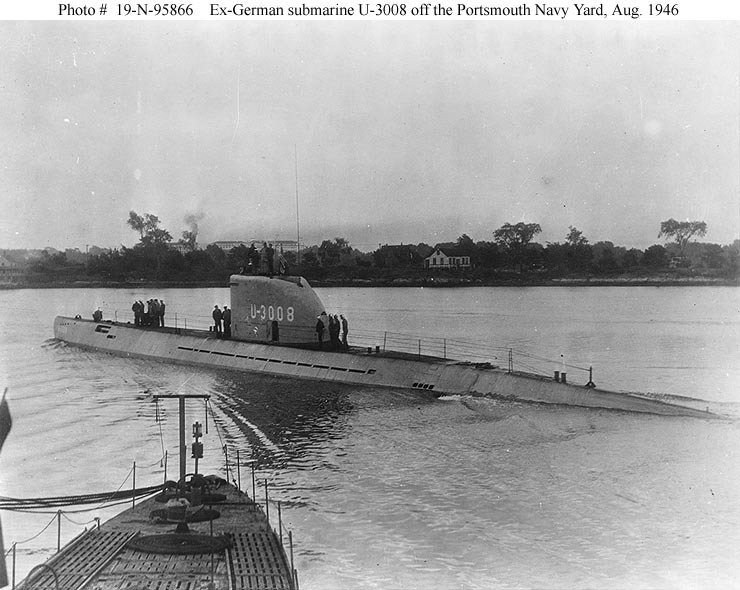 84k U-3008 off the Portsmouth Naval Shipyard, Kittery, Maine, 30 August 1946. Photograph from the Bureau of Ships Collection in the U.S. National Archives. Official USN photo # 19-N-95866,from the collections of the Naval Historical Center. 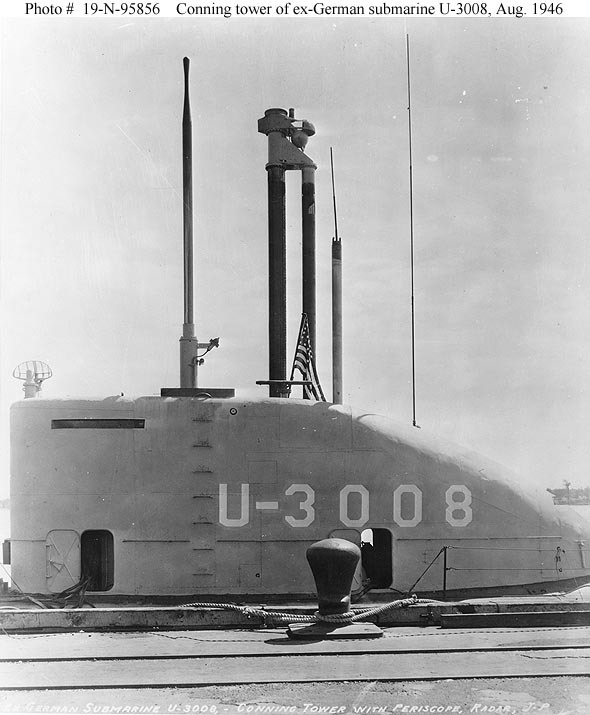 73k U-3008 at the Portsmouth Naval Shipyard, Kittery, Maine, 30 August 1946. Photograph from the Bureau of Ships Collection in the U.S. National Archives. Official USN photo # 19-N-95861, from the collections of the Naval Historical Center. 101k U-3008 at the Portsmouth Naval Shipyard, Kittery, Maine, 30 August 1946. Photograph from the Bureau of Ships Collection in the U.S. National Archives. Official USN photo # 19-N-95863,from the collections of the Naval Historical Center. 66k View of the port side of the U-3008's conning tower, showing periscope, snorkel and antennas raised. Taken at the Portsmouth Naval Shipyard, Kittery, Maine, 30 August 1946. Photograph from the Bureau of Ships Collection in the U.S. National Archives. Official USN photo # 19-N-95856,from the collections of the Naval Historical Center. 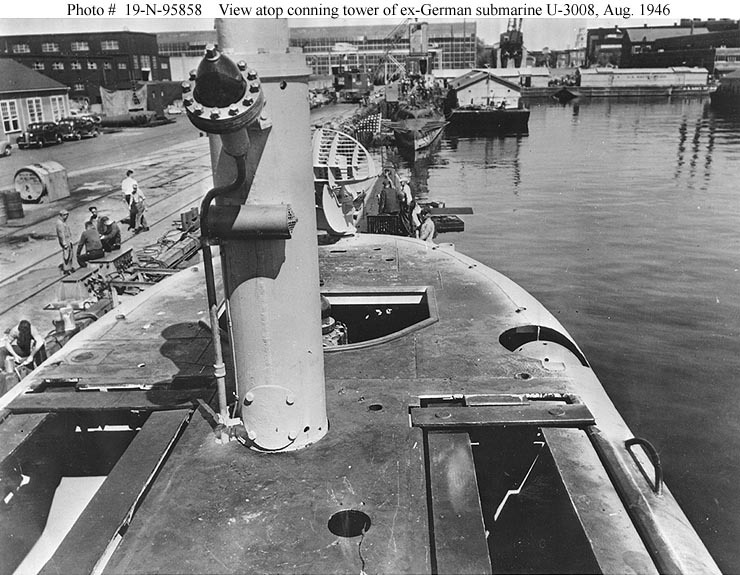 113k View atop the conning tower of the U-3008 looking forward, showing periscope base. Taken at the Portsmouth Naval Shipyard, Kittery, Maine, 30 August 1946. 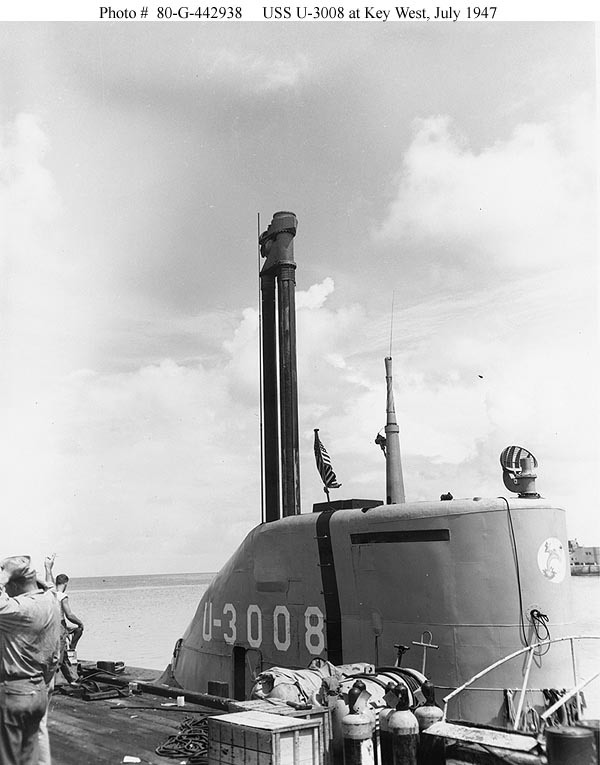 Note the stern of an unidentified submarine ahead of the U-3008. Note also the U.S. Navy jack flying at her bow. Photograph from the Bureau of Ships Collection in the U.S. National Archives. Official USN photo # 19-N-95858,from the collections of the Naval Historical Center. 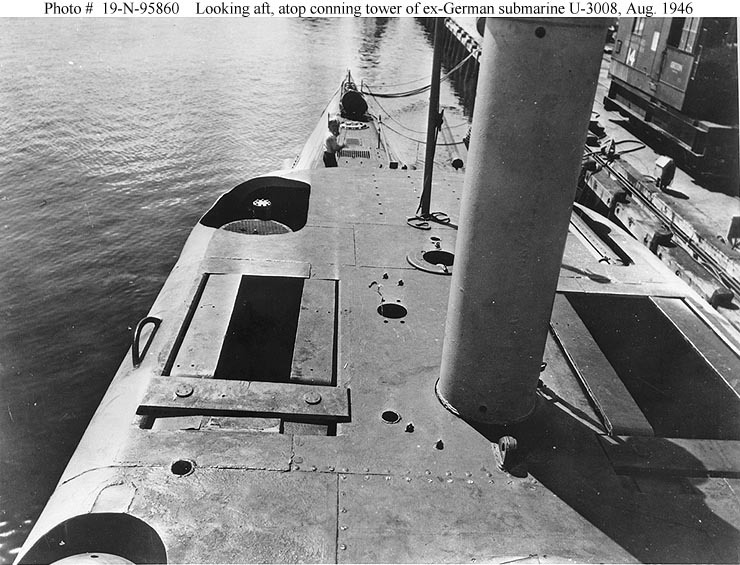 111k View atop the conning tower of the U-3008 looking aft, showing periscope base and retracted snorkel. Taken at the Portsmouth Naval Shipyard, Kittery, Maine, 30 August 1946. Photograph from the Bureau of Ships Collection in the U.S. National Archives. Official USN photo # 19-N-95860,from the collections of the Naval Historical Center. 65k View of the U-3008's conning tower, with her snorkel raised. Taken at Key West Naval Station, Florida, 25 July 1947. Note her insignia painted on the front of the conning tower. Photograph from the Bureau of Ships Collection in the U.S. National Archives. Official USN photo # 80-G-442938,from the collections of the Naval Historical Center. 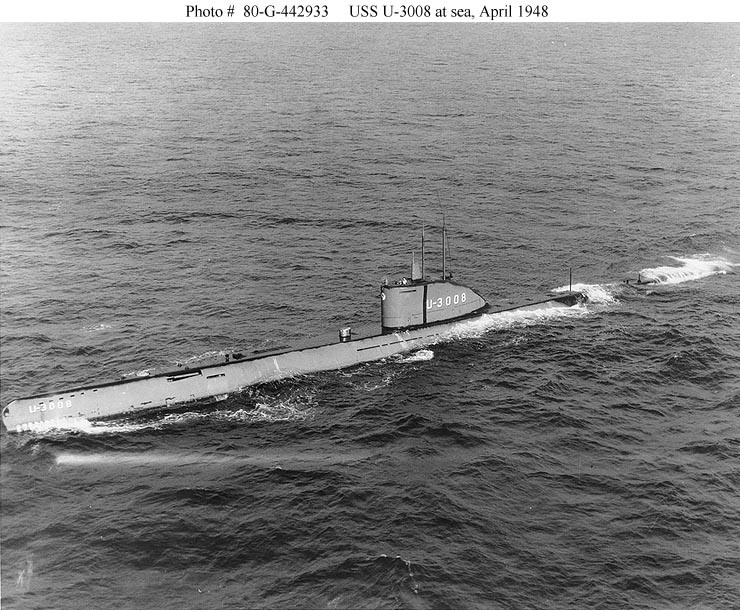 135k U-3008 underway at sea on 15 April 1948. Photograph from the Bureau of Ships Collection in the U.S. National Archives. Official USN photo # 80-G-442933,from the collections of the Naval Historical Center.